A couple of weeks ago we went out to dinner at the fine establishment you see in the photo above. Fun for the whole family, right? Are you thinking, “What were they thinking?” Because…we were thinking that when we finally found it. Let me back up a bit. Group discount deals are all the norm anymore and I get so many in my inbox I now I usually ignore them all. But this was one I actually opened, clicked the links, and thought, “Hmm, sounds like it might be a good deal.” I bought the Groupon (or whichever other site it came from). It was to Thunder Alley in central Oklahoma City. On the night in question we had our fourth preview service for City Pres that night and I thought it would be fun to go out for dinner afterwards. I printed this deal out and we made our way…straight to a Hooters restaurant in central Oklahoma City. Again, say it with me, “What were they thinking?” We drove all around where the GPS said the address led us to and it had led us straight to a Hooters restaurant. I don’t know if you know me well or not, but there’s no way on the planet I will ever intentionally set foot in that place, let alone take my husband and kids into it. Confused and getting more frustrated by the minute, we finally pulled over at the gas station right next to it. Craig went in to see if they knew where Thunder Alley was. They pointed to the building just behind them and said, “It’s on the other side of that fitness place.” Okay. 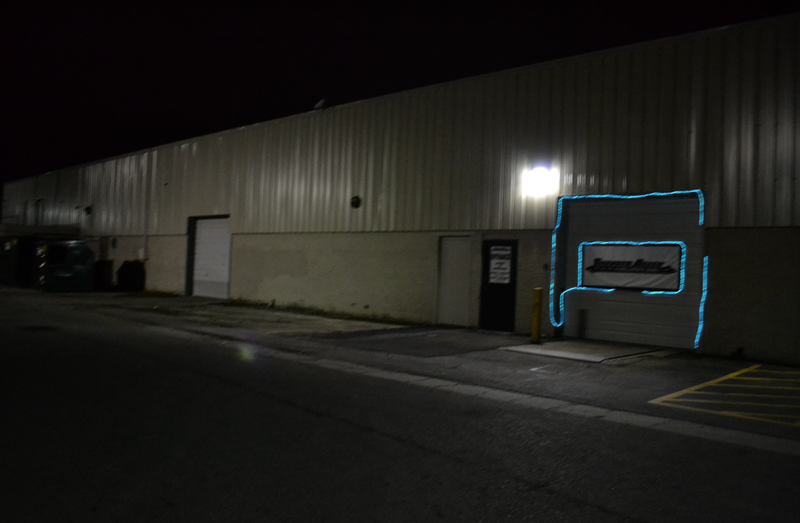 We drove around and we saw what you see in the photo above – a skanky-looking alley with a garage door outlined in trashy blue Christmas lights. We half-expected to have to tap a code on the door and give the secret message before being admitted. I wish I’d taken a photo of the inside for you, not because it was so so so so much more aesthetically amazing than the outside was, but because it WAS a serious improvement over their first impression. It was almost completely empty the night we went and the guy who was bussing tables was also the host. He was also our waiter. He was also our chef. He was a one-man show that night. And the food? It was seriously amazing. I’m not sure how he pulled that off, working completely alone the way he was, but he did it and all six of us left that night wondering just what it was that we had experienced there. It was weird, you know? The senses, they did not match up, but the overall experience was a good one. I’m trying to figure out where I’m going with this story because in some weird way I think I am the story. I feel like I’m the living embodiment of 38 years’ worth of underdeveloped potential. I think on occasion I have the capacity and ability to pull off something pretty amazing, but I think when it does happen most people are thinking, “What? How?” Because most of the time I give off the outside of Thunder Alley impression. I feel like most of what I do is sit in my car staring at the trashy blue lights outlining the garage door of my future, afraid to walk through it to see if there’s anything worth experiencing on the other side. Sometimes I wonder if it’s just safer for people to assume I am the trashy blue lights and drive away. Compare, compare, compare. It’s pretty much what I do best and I’ve been doing it really well ever since middle school. I compare myself to others, I get discouraged by what I see as all my shortcomings, I decide to stop trying. Wash, rinse, repeat. I think I’ve talked myself into somehow being okay with this warped worldview for living, but I’m now seeing the same pattern in my teen/pre-teen kids and it kills me to know they are heading down that same path. I can tell them they are beautiful because I think they are. I can tell them they are intelligent because I think they are. I can tell them that their lives have meaning and value because I truly believe they do. But if they don’t believe it for themselves, my words don’t hold much weight. I know. Because it’s the world I inhabit every single day. I’m not writing this post for the purpose of hoping a bunch of people come back here to debunk everything I’ve said. I’m not writing it in an attempt to resolve to do better this year. I’m writing it simply because I think I finally need to put words to these feelings that have pressurized inside me for over twenty-eight years. Maybe this is the year I find contentment in the critique. There’s more and it’s all worth reading, so scoot on over there and be encouraged (or challenged). Compare or be content. Compare or be content. Compare or be content. Thanks, Megan – for sharing this piece of your heart… blessings, friend! Isn’t it always nice to have great experiences like these that we can relate back to our own life? I think a lot of us struggle with seeing the good in us that others see! What a great post! I feel the same way sometime and you summed it up perfectly. Onne of my favorite quotes that fits this is “The time came when it was more painful to remain the same than it was to evolve” or something like that. It seems you’ve hit that tipping point. How exciting! All the best to you and yours.